Forget the 30 second elevator pitch to promote your company or brand. When a customer clicks on your website you have about 4 seconds to get across your companies message and brand. 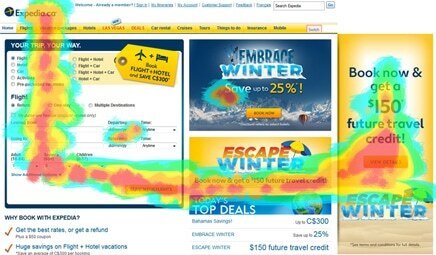 There has been significant research into the “heat map” of a consumer’s eye as it scans over a homepage to decide if it is the right website for them. Typically speaking, in the same way we read books, the customer will follow an “L” shaped pattern like this heat map. This is where you want your company slogan, strap line or at the very least a solid idea of what you offer. We’d suggest NOT having special offers, last minute deals or anything that could devalue the brand on the left hand side. At the end of the “L” is there a good follow on page? Like “Services”, “Contact Us” or like Expedia above a Book Now call to action? Have a look at your own website and see how it fits the heat map. As part of our Internet Marketing support we help companies get their website perfect for that user experience and also increase website traffice through a number of different Internet Marketing channels.